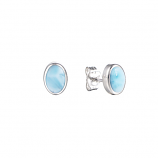 Larimar is a rare mineral sought after for its rich blue coloring and white highlights. 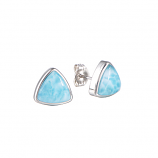 This stone is often said to mirror the oceanic landscape of the Caribbean – the only region of the world where it can be found. 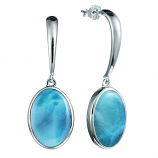 At The Cedar Chest Fine Jewelry, we incorporate stunning selections of larimar with sterling enclosures and earing components so our customers can integrate the tranquil beauty of the sea into their daily wardrobe. 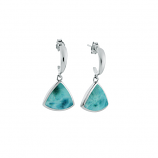 This collection features both abstract fashion pieces and direct interpretations of coastal elements like sand dollars and even the sun. 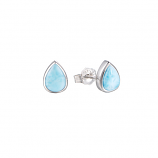 Sterling larimar earrings will make the perfect addition to the ocean enthusiast in your life’s jewelry collection – or your own. 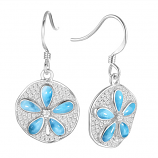 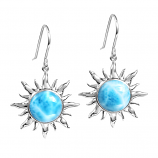 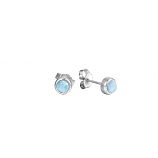 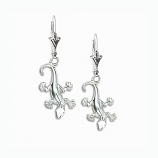 Have Questions About Our Sterling Larimar Earrings Collection?